This is a good place to start your search for tango books if you are dancing Argentine Tango and want to read more about it. Or are you looking for gift ideas for tango dancers, newbies, or do you wanna treat yourself? These tango books might be exactly what you are looking for in order to create happy faces not only under the Christmas tree. You are only thinking about starting to dance Argentine Tango. “Strictly come dancing” has definitely a motivational effect on people in the UK and other countries to start learning Argentine tango. The tango marked place is a growing one. 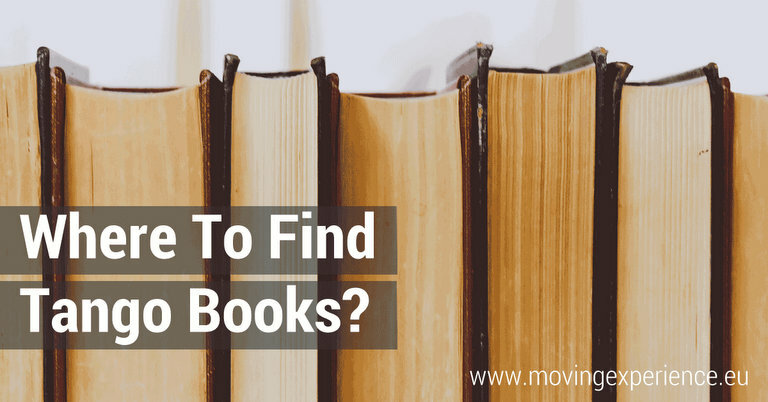 It might be possible that your favourite tango book is missing. In that case please drop me a line via info@movingexperience.eu. I am happy to add more books. If you are selling/writing tango books I am happy to add yours in exchange for a back link and LIKES on Facebook (Tango DJ Bärbel Rücker & Moving Experience). Thank you in advance. With Tango Stories Michael Lavocah created a new genre of tango writing, an overview of the tango music of the Golden Age written for the dancer. It was rapidly embraced by the tango community all over the world as the dancer’s guide to tango music. In this unique book, Michael Lavocah takes you on a compelling journey through tango music. He introduces the key individuals who shaped tango history, telling their stories in a series of lively vignettes. Engaging, entertaining and passionate, Tango Stories: Musical Secrets has been embraced by tango dancers around the world as the definitive guide to tango dance music. Tango Masters is a series of books by Michael Lavocah exploring the great dance orchestras of tango’s golden age. Troilo, Pugliese and Di Sarli are released, and D’Arienzo is scheduled for 2019. In this book, the first in a series called Tango Masters, Michael Lavocah (author of Tango Stories, Musical Secrets) explains Troilo’s music to the modern dancing public. He introduces the musicians in the orchestra, helping you to hear them within the music, and then takes you through the dance recordings, paying special attention to the relationship between the music and the lyrics – a key factor to understanding this orchestra. Incorporating an invaluable discography, ‘Tango Masters: Aníbal Troilo’ allows the reader to follow Troilo’s journey as his music grows in sophistication, learning how to listen, and thus to feel, with more understanding and depth. This is Michael Lavocah’s second volume of the series Tango Masters, which explores the music of the great orchestras of tango’s Golden Age in depth. Dive into the life and work of Osvaldo Pugliese. Osvaldo Pugliese (1905-1995) created a new style of tango music that was beautiful, warm and powerful – the most passionate and intense that tango has ever known. He formed his orchestra in 1939 from a cell in Argentina’s most notorious political prison. Standing firm against decades of persecution for his communist beliefs, he eventually led his musicians and his devoted fans alike to a triumphant night at one of the world’s grandest opera house. After eighteen months of hard work, volume 3 of Tango Masters is here! Carlos Di Sarli created the most elegant tango music ever known. Uniquely amongst the great orchestras, his final recordings are loved as much or even more than his early ones. Great waves of melody create a majestic feeling, although the music remains at heart quite simple, a combination which makes it a favourite of those who love to dance. Whilst the melody is carried by the violins, the heart of the orchestra is the piano of Carlos Di Sarli himself. Tango Masters, Carlos Di Sarli tells the story of the man and his music. Listening guides to almost a hundred of Di Sarli’s songs help you to appreciate, love and dance to this beautiful and elegant music. If you are interested in Argentine Tango and wanna know more about the different tango orchestras, David Thomas’ book is a good start. He will talk you through the main 20 orchestras you will be dancing to at the milongas. His style is entertaining and he offers playlists too. This book is about traditional tango dance music – that is, the music recorded by dance orchestras in Argentina between the late 1920s and late 1950s. It’s mainly a resource for new, inexperienced or even reluctant tango DJs – people who are taking responsibility for providing the music for dance events. It suggests a ‘starter collection’ of five hundred songs, arranged into ready-made tandas, intended to present the best orchestras and singers, and with the content weighted according to the relative importance of the different orchestras and representing their best periods. After several months of interviews with María Nieves, the author of this book was able to shape a biography, and, with marvellous generosity, relinquished her first person voice to the dancer who transcended borders and represented Argentina to the world. In this book María Nieves is sensitively led to tell about her life: her darkest and her happiest moments. ‘The Meaning of Tango’ traces the roots of this captivating dance, from it’s birth in the poverty stricken Buenos Aires, the craze of the early 20th century, right up until it’s revival today, thanks to shows such as Strictly Come Dancing. This book offers history, knowledge, teachings and in-sights which makes it valuable for beginners, yet its in-depth analysis makes it essential for experienced dancers. It is an elegant and cohesive critique of the fascinating tale of the Tango, which not only documents its culture and politics, but is also technically useful. If you are interested in Argentine tango you know that, as Veronica writes in one of her essays, “Tango, no matter your involvement in it, becomes a kind of a world separate from the rest, with its own particular joys, sorrows, difficulties, rules, goals and pleasures.” And in this world there are both happiness and suffering. Whether you are a total beginner or an experienced dancer, in Veronica’s essays you will discover a rich source of knowledge and inspiration as she tackles complex psychological, social and pedagogical issues in tango as a social dance and a performing art. Hier kann man sich ein Bild über die großen Maestros machen: Gustavo Naveira & Giselle Anne, Mariano ‘Chicho’ Frumboli, Rodrigo ‘Joe’ Corbata, Lucila Cionci, Carlos Espinoza & Noelia Hurtado, Maria Ines Bogado & Sebastian Jimenez – Ihr Werdegang, ihr Unterricht, ihre Unterrichtsphilosophie, was sie über den Tango denken u.v.m. Bestellbar bei Amazon.de. Leseproben auf www.sutango.com unter „Publikationen“. Die folgenden Tango Bücher sind im Moment ohne besondere Ordnung und Wertung gelistet. Einige Autoren haben mehrere Werke verfasst und sind im besten Fall direkt nebeneinander. Zu einem späteren Zeitpunkt werde ich versuchen, die Bücher in Kategorien zu sortieren. Auf jeden Fall viel Spass beim Stöbern. A Tango Book Is Missing? Is your favourite tango book missing? Have you written a tango book yourself and would like me to add it to this list?